Do you shop on Amazon? 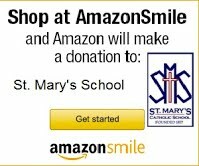 Did you know that Amazon will donate a portion of the proceeds for your sale to St. Mary’s School! Click here or on the Amazon Smile box below to choose St. Mary’s School as your charity. Then, click here to take a look at the St. Mary’s Catholic School Wish List.